Outdoor Activity. North from Pefkos, near Archangelos. 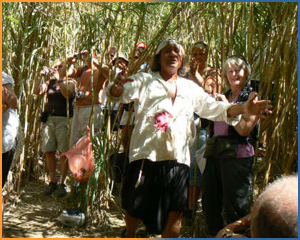 Nikos Papas will walk you through his Jungle territory near Archangelos in Rhodes. See the local healing herbs, plants, fruit trees and the benefit of nature's natural habitat. In his best English he explores with you local flora, butterflies, wild birds, turtles and little fish. Trek through undergrowth, streams, tropical terrain with beautiful scenery. A day full of happiness and humor with your host-of-the-day: a charismatic Greek of a Rhodes-mountain village! Total walk: 3-4 km in about 5/6 hours; 300 meters till ankle or knee deep water! No need to bring food & drinks.